There were many disturbing images and themes in Stephen King’s The Shining. The one that stuck with me most was the concept of becoming dull and irrelevant if you allow yourself to focus on one area of your life too much. And what is the area we all tend to over emphasize? Work. That’s the one that pays the bills, offers advancement (sometimes) and grants fulfillment (again, sometimes). But if Jack Torrance (Jack Nicholson’s character in the Shining) reveals anything, its truly that balance in our lives is needed to stay out of the loony bin. Personally, I used to have a pretty good (and easily maintained) work/life balance. My job was fun and challenging, but rarely was there a time when I had to take work home. Part of that was through conscience effort, part of it was just the nature of the role. Today, my idea and ability to maintain a balance between work and personal life has gotten a little skewed. As many of you know, a few months ago I reduced my responsibilities at my full time job to pursue two independent endeavors: a website business my wife and I started a few years ago (www.stampingschool.com) as well as my own independent training and consulting business. So now, unless I am out with a client (or happen to be writing a blog post on my iPhone sitting next to a lake – like now) most of my work occurs at home. I now have to actively seek out opportunities and make deliberate decisions to change scenery, to get a new perspective or to just stop working. I’ve gotten in the habit of getting up early and going for a long ride on my bike, usually stopping for a few minutes at a local park or lake for a little breather. Since I will likely be inside on a computer for a good portion of the rest of the day, this gives me my nature and activity fix, as well as a change of scenery. Then the rest of the day I am not going stir crazy wondering when I can go outside for a few minutes. So how does my personal story of finding balance impact you? That’s partly for you to decide. 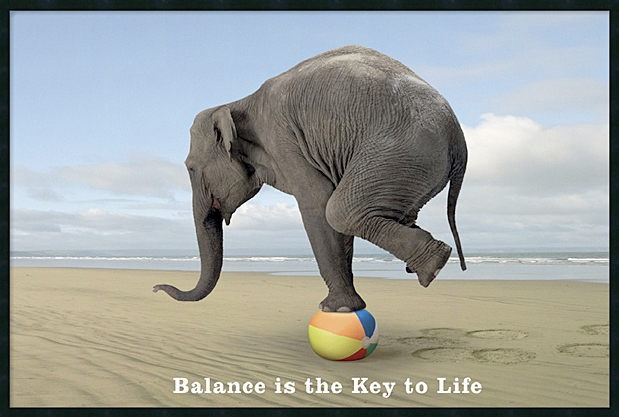 What I will say is that when it comes to leadership, balance is a topic that comes up A LOT. Over the last few years, I would say that it has come up in just about every class I’ve taught or discussion I’ve had with other leaders. The first step is to recognize the need for balance, then figure out if you have it. If you have ever felt like breaking through a door with an axe, you may not have the balance you seek. I used to work with a guy who set the standard for learning. He was always looking to learn new things and “sharpen the saw”, as he put it. When I read the email below from Izzy Hyman, it made me think of how we need to continually work and learn to get better. Izzy runs a great online tutorial website for shooting and editing video, and occasionally sends out little pieces of advice. No matter what industry or discipline you choose, the message is worth it’s weight in gold. Content reprinted in its entirety with permission. Wondering what I mean by that? Last night Noell and I were listening to some Dave Matthews songs (I’m a recent fan — only started listening to him a few years ago), and I kept thinking how amazing he is on the guitar. I wondered how much time and effort he put into mastering it. My guess is that he’s devoted years to the guitar. And it shows. The guitar is his instrument of choice. When it comes to shooting video, our instrument is the video camera. In some ways, we should learn to play our cameras like Dave Matthews plays the guitar. It might be that you have no interest in mastering your video camera, and that’s cool. Not everyone wants to be a rockstar video shooter. But if you want to shoot amazing video, you might need to spend significant time with your camera. To me, Izzy hits the nail on the head with leadership as well as shooting video. We can’t become better leaders by sitting in an office. We can’t become better leaders by avoiding confrontation. We can’t become better leaders if we aren’t open to learning new things. And we certainly won’t become better leaders if we shy away from making mistakes. We’ve got get out there and mix it up. As a leader, your instrument is people. Based on your performance and actions you can either make them sing or scream. Depends on how much you practice. Thanks for the inspiration, Izzy! The other day, my wife surprised me with the gift of thrill rides. These were thrill rides on TV, but nevertheless, they were thrill rides. The Travel Channel was running one for their summer specials, this one was entitled “Extreme Terror Rides”. Linda thought that sounded like something I would enjoy, so she set the DVR. And she was right. This particular episode was originally released in 2008, so I had heard of many of these contraptions, but many I had still not ridden. So, I perched my feet up to enjoy the ride. About 1/2 way through (more or less) there was one particular ride that riders had to weigh in for to make sure they had the right harness. The attendant very proudly showed the camera what they used for a checklist. This is literally a screen shot of what was shown. Now, I have filled out my share of checklists in the past, and I have certainly seen the effects that living outside can have on a stack of papers and a clipboard. My observation here is this: is this really how you want your facility portrayed on TV, or at all? Most of us know that the perception of safety is largely determined by what we see and experience. Notice I didn’t say reality… there was a study done once in the airline industry regarding why passengers didn’t fly on a particular airline more than once. The surveyors expected to hear things like it was the schedule, price, even rude employees. Overwhelmingly, though, the top reasons were things like coffee stains on the tray tables or trash left in the seat pocket. People are equating the cleanliness and upkeep of the cabin with the safety of the aircraft. Do people do this in our parks? You bet. So it may be time to double check your checklists, or other things that can give off the perception that you don’t pay attention to the details. 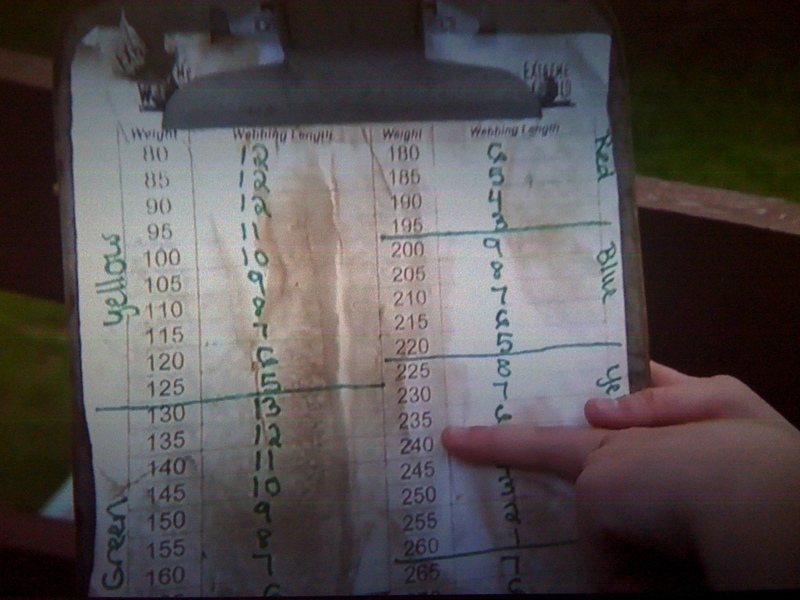 As a sad and sobering footnote to this story, there was a fatality in 2010 at the park with the messy checklists above. Unfortunately, it was an operator not paying attention to the details that ultimately caused the accident. I’ve always liked the song “Closer to the Heart” by Rush. (I like a lot of songs by Rush, but that’s a different post for a different time). In the past when I’ve thought of this song it was about the music, the performance or the lyrics (what else is there, right?). How about the message. I heard it again this morning and was really struck by the message behind the lyrics. It’s a lesson in leadership, teamwork and communication. If you’ve never heard the song before, check this out. Having heard the song a bazillion times, I have my own interpretations about the message. Leave a comment and let me what you think this says about leadership. I’m a ‘why’ guy. I like to know why things happen, why certain things are the way they are, and why people do what they do. Especially in the last few years, I’ve really started diving into the question why, and the answers are often fascinating. What sparked this as a post was another bike ride. I was pedaling past an elementary school and on the marquee out front was this message, “Have a safe a relaxing summer”. A nice sentiment, I thought, but then I quickly wondered why schools take the summer off. I’m sure it’s not to give teachers a break (although I am sure they need it) or to keep amusement parks in business, so what could it be? I continued riding and wondering… was it due to farming? I don’t know much about harvest cycles, but I didn’t think summer was prime harvest season. So what was it? Turns out that in rural areas, it was farming that set the time frame for school, but the kids we not on vacation during the summer. They were in school in the summer and winter and working on the farms in spring and fall. In more urban areas there were concerns of the poorly ventilated schools being too hot and that kids were too fragile to be in school that long. Eventually the urban and rural schedules met in the middle and viola – summer break. If you’d like to learn more, click here. Now, as interesting as that is, what does it do for me? Increased my personal knowledge? Sure. Exhilarating party conversation? You bet! More importantly, I now understand why it is the way it is. The more I understand, the more intelligently I can act. How often do you ask why? As a leader, it can be easy sometimes to simply accept certain things for the way they are. This may not be due to a lack of curiosity, but maybe a lack of time or energy to pursue the real why. I definitely think this happens with our employees a lot. We see them leaning and tell them not to. We see them not smiling and we tell them to be happy. But do we every get to WHY they are doing those things in the first place… and I mean the REAL why… not because we think they are lazy or they don’t care? Before we can alter a behavior, we have to understand why it’s happening in the first place. For now, think about the things you do just because you do them. Is it a process, a habit, a business practice? Why do you do it that way? If you can’t come up with a good reason, maybe it’s time to ask yourself why you do it in the first place. Thanks for reading – stay optimistic!